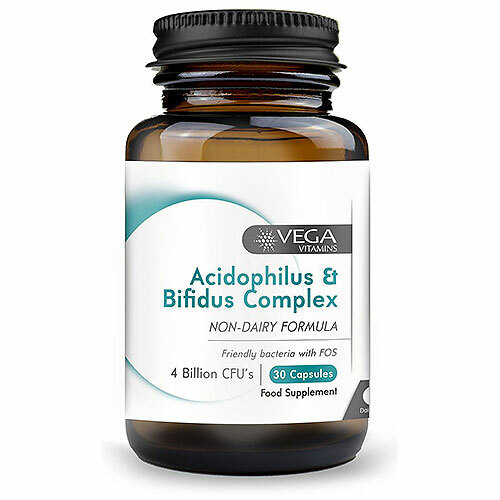 Vega Vitamins Acidophilus Bifidus Complex is a dairy free formulation, synergistically formulated with prebiotics, probiotics and antioxidants. Fructooligosaccharides (FOS) is a well known prebiotic, it is a carbohydrate that provides nourishment for both, lactobacillus and bifidus bacteria. Lactobacillus bacteria are predominantly found in the small intestine, whereas the bifidus bacteria colonies mainly the large intestine. Gut flora plays a role involving the absorption of nutrients and synthesis of certain vitamins. Vega Base™ (Acacia Gum, Fruit Juice Concentrates (Aronia, Apple, Elderberry, Blueberry & Blackcurrant)), Fructooligosaccharides (Cichorium intybus), Vegetarian Capsule Shell (Hydroxypropyl Methylcellulose, Colours (Titanium Dioxide, Copper Chlorophyllin), Acidophilus & Bifidus Complex (Lactobacillus acidophilus, Lactobacillus casei, Bifidobacterium animalis subsp. lactis, Bifidobacterium bifidum), Anti-caking Agent (Magnesium Stearate). Children 3-15 years old, open the capsule and take half to one capsule daily sprinkled into water, juice or milk. Do not exceed recommended intake. Below are reviews of Vega Vitamins Acidophilus & Bifidus Complex - 30 Capsules by bodykind customers. If you have tried this product we'd love to hear what you think so please leave a review. Vega Vitamins Acidophilus Bifidus Complex is a dairy free probiotic with prebiotic and antioxidants. Gut flora play an important role in the body, they support the digestive process, bowel function and detoxification.